Uproval is the leading supplier of the tailored and innovative roll wrapping and handling solutions for every mill. Together with Uproval you get seamless total solution for your roll handling and achieve maximum operation safety. Uproval was founded in 2018 in order to continue support and deliveries of SAIMATEC products and services. Uproval works with a compact organisation consisting of core personnel with background in earlier Saimatec organisation, added with a comprehensive network of co-operation partners and sub-suppliers. With Uproval’s innovative solutions we solve challenges of space usage, optimise mils’ internal logistics and increase uptime, so customers may rely on steady performance with stable top quality. Low operation costs and top class efficiency are also benefits. 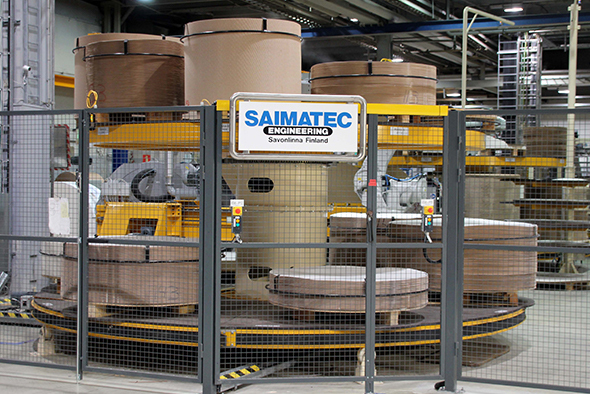 Saimatec was started in 1981 by Seppo Rasimus as an engineering consultancy, and company gradually grew into role or systems supplier for paper mills internationally. Organisation included also own manufacturing. Development in 2017 led to situation that it became necessary to split the activities into two companies, and Uproval Oy was founded for this purpose early 2018. Uproval continues supplies of SAIMATEC roll handling and roll wrapping products, services and spare parts to existing and new customers world wide. Uproval and Saimatec have entered into contract based on which the SAIMATEC brand as well as immaterial property rights for roll handling and roll wrapping products are acquired by Uproval. Important background for founding of the Uproval company is also generational change at company leadership, Heikki Rasimus now starting as CEO of the new company.